My parents celebrated their 35th wedding anniversary last week and I couldn’t resist baking cupcakes. If you missed their Anniversary gift you find it here. 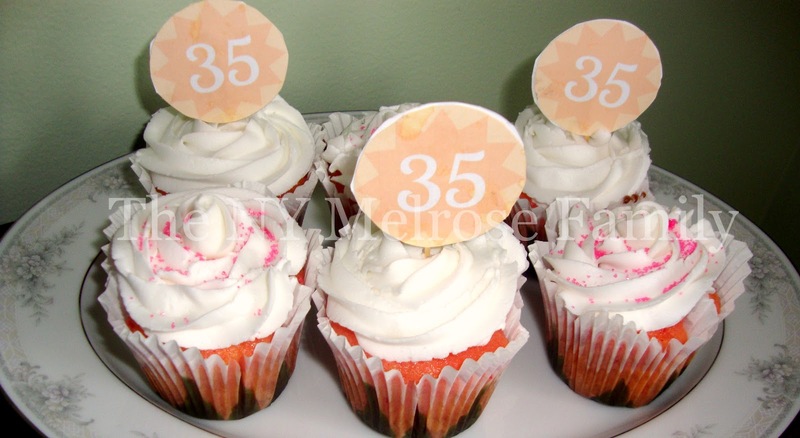 Do you know what the traditional gift for a 35th anniversary is? I didn’t. It’s coral. Seriously?! So incorporated it into my cupcakes. I used my 1M tip to make the buttercream frosting have the look of a rose, which were the flowers my mom carried in her bouquet. 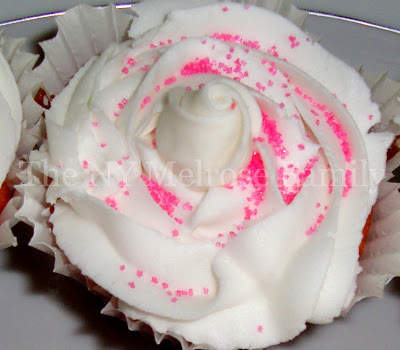 I topped this cupcake with a sugar rose and some pink sugar for some added color. I saw these liners at Michaels and just couldn’t resist. The green that you see towards the bottom is meant to be the leaves that surround the petals of a flower. I wasn’t really pleased with the way that they fit in the cupcake pan though. I think they were meant to have the dips of the petals, but I would rather have them straight so that I could just have my frosting be the petals. 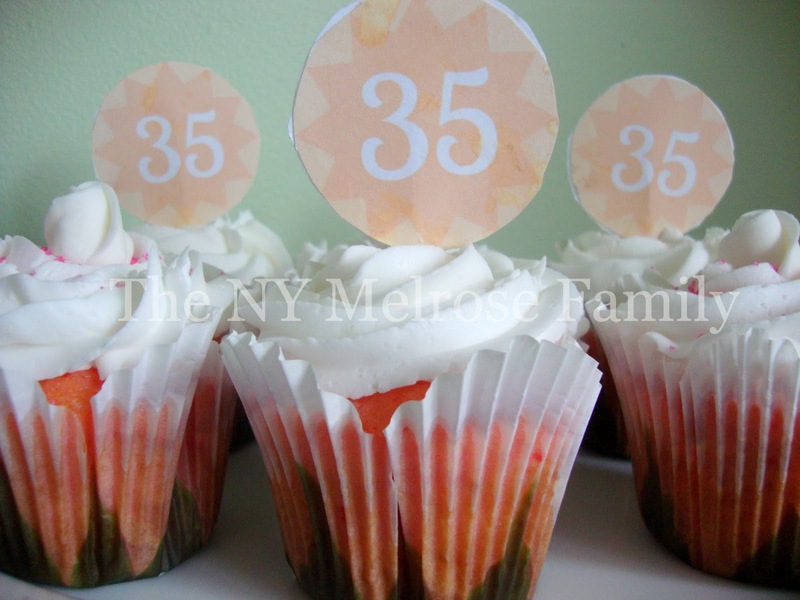 I incorporated the coral color with the cupcake toppers, which I made in PicMonkey. 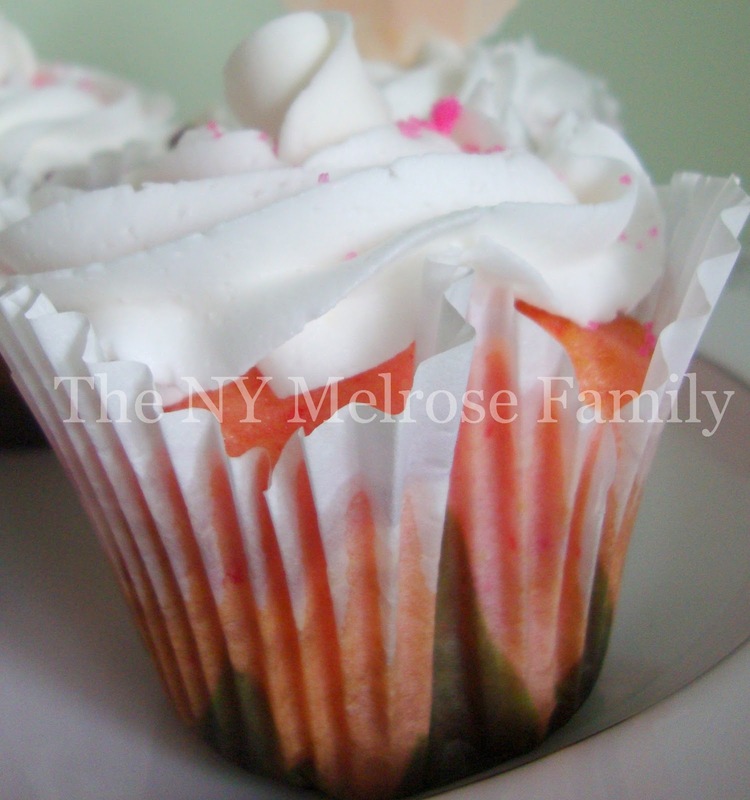 The cupcake itself also has a coral tint to it because it is strawberry cake. I’m not quite sure who enjoyed the cupcakes more, my parents or Riley and my nephew, who spent the day with my parents. Beautiful cupcakes, they look so good, I love those liners, I have the same ones. These are so sweet! I need to figure out this whole picmonkey thing. Those are so pretty! How nice that you made cupcakes! They turned out beautiful! The flower you made with the frosting is perfect! Happy Anniversary to them! What great cupcakes. 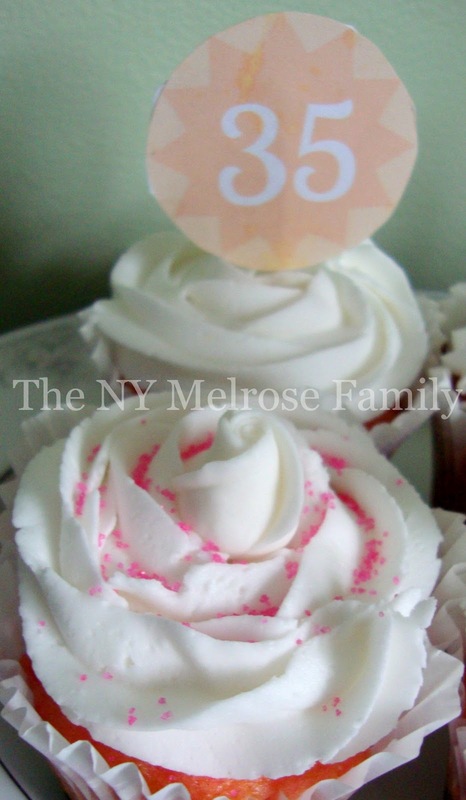 I love using picmonkey to create things like toppers, so great! Your cupcakes look so delicious! Happy Annivesary to your parents. Lots of hugs for 35 years. They look so pretty, and I bet they tasted delicious! What a happy occasion! How lovely are these cupcakes. I thoroughly enjoyed this delicious post. I would love it if you could share this wonderful post at our WIW linky party. I hope you can join us. Ok, now I am craving a cupcake! Those turned out great! Yum Yum!!! I just found your blog on Mrs Foxs Sweets. I'll host a party every month with a different theme and would love you to join! 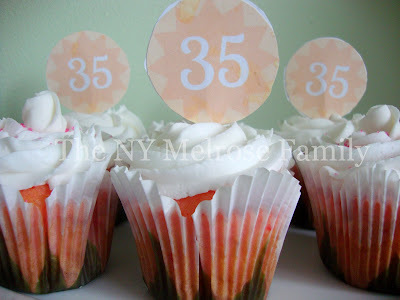 Please visit my blog for more information on “My Sweet Party” post uploaded 2nd of May. Mmmm, cupcakes. I have decided I like them better than regular cake. These look so good! Thanks for sharing on Tout It Tuesday.